Brigid (left) Shannon (right) get ready to show America that "they got talent"! After auditioning in an open casting call in Philadelphia, Brigid and her younger sister Shannon waited to hear if they would be performing for the celebrity judges on NBC's hit show America's Got Talent. Just like the 70,000 other acts across the country that auditioned, they would have to be patient as they wait for that one big chance. The Harrington sisters have been performing together since they could walk. Four years apart in age they make a dynamic team, performing at local community events. 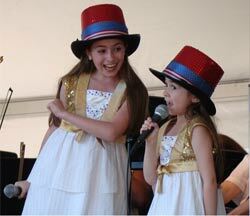 One of their favorite numbers is a reworked version of the George M. Cohan classic "Yankee Doodle Boy". In the sister's version the lyrics are changed a little to "Yankee Doodle Girl". Their performance was always a crowd pleaser (especially on the 4th of July), so it seemed only natural to use this number along with some added tap dancing, for America's ultimate talent show. Performing for Celebrity Judges at the Hammerstein Ballroom, NYC. When the call came that Brigid and Shannon were picked as one of the 420 acts out of 70,000 to perform on camera in front of the celebrity judges, they were very excited. When they found out they were performing at the Hammerstein Ballroom in New York City, they were beyond excited. What an incredible experience, being interviewed by host Nick Cannon, performing live in front of a huge supportive crowd, and having a hilarious exchange with the judges. 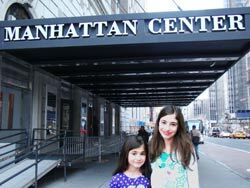 It was both the girls' debut on a New York City stage and they could not have been happier with their performance. To top it all off, the girls were featured in a promo for the show that summer in a spot that featured the show's top acts. Judge Howie Mandel asked Brigid if she wanted to be a singer and dancer and Brigid said "Yeah" followed by a long explanation of everything she wanted to do, ending with wanting to be on Broadway. The crowd went wild. Then he asked Shannon the same question and without missing a beat Shannon said "Yeah, what she said". This was used in the promo. The Hammerstein erupted in laughter and applause. The girls proved that they got talent. Brigid and Shannon in front of the Hammerstein Ballroom, NYC. 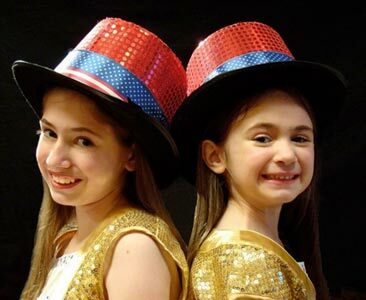 Brigid and Shannon also performed their America's Got Talent number at the OceanFirst theatre in NJ 2 years in a row.